Remember when Eddie Murphy had a “singing career”? We look at one of his most (in)famous tracks for this week’s Throwback Thursday. We all know Eddie Murphy as the comedian/actor with the funny laugh, fast-paced wisecracks and fat suits but he also had brief stints as a singer. It all started in 1985, two years after his critically acclaimed stand up Delirious, when he released his debut musical album How Could It Be. With help from Rick James and Stevie Wonder (on a couple of the tracks), it was a commercial success but a cannon fodder for the critics. Party All The Time was the only real hit of the album, reaching #2 on the Hot 100. Another album followed, So Happy, but that failed both commercially and critically, despite the help of Nile Rodgers. It would take Murphy another four years to finally get the message that singing wasn’t for him with his final album, Love’s Alright. Tanking again, the only notable part of the LP was Whatzupwitu. 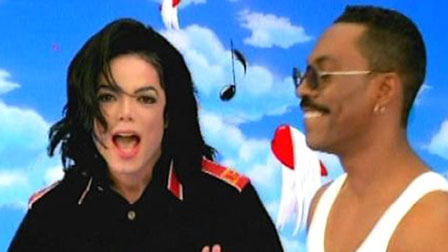 Featuring none other than the King of Pop himself, Michael Jackson, the video was the main focal point of ridicule, despite direction by Wayne Isham and Klasky Csupo, creators of Rugrats and The Wild Thornberrys. If blue skies, flowers and cheesy messages of positivity and an ideal world are your thing, you might actually like the video but we’re guessing that’s not many of you. The kind of vibe Eddie Murphy was going for in this was what made De La Soul and A Tribe Called Quest so great during the “Daisy Age” but that had since died out for the pair. Yes, PM Dawn were still keeping the flame alight with The Bliss Album…? (released in the same year) but at least they were good. Somehow, a wifebeater-clad Eddie Murphy with flowers, trees and children just wasn’t gonna cut it. Seems ironic that a collaboration with the most famous musician in the world would contribute to the end someone’s music career. Thanks?